Apple has made a tremendously successful company off of one thing… Is it the iPhone, iPad, iPod, or Mac series? No. What makes Apple so powerful and successful is not its products, but rather the ecosystem it’s created through its standard operating system, the iOS. An operating system or “platform” that enables its users to connect with the rest of its users as a community and its developers. With this common platform, all users are on a level playing field with a similar access to all “apps” and services that have been created on the platform – rather than each user building everything themselves. While this wildly successful model exists in several industries, it has failed to gain traction with credit unions, especially as it pertains to digital transformation (including data and analytics). Instead of having one common platform, credit unions are all on their own unique “platforms” comprised of different data sources with different data definitions. In other words, each credit union is on its own to create all new “apps” and services required to compete in the modern world. At one time, this wasn’t an issue but with the new regulatory pressures and competitive threats of today, this is no longer a viable option for credit unions. 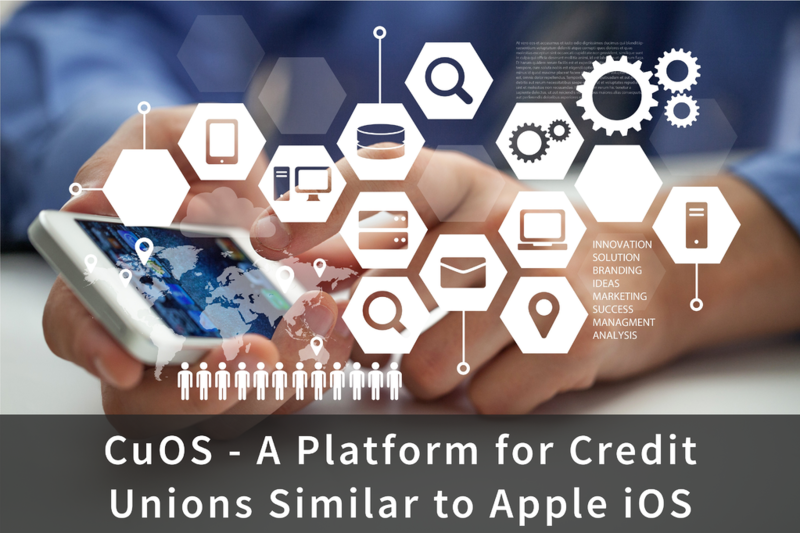 In the new, digitally-transformed world of today, credit unions must adopt a collaborative and common “platform” to compete, which for the sake of a better term, I will call the CuOS (or Credit Union Operating System) to stay aligned with the Apple iOS analogy. Doing so will require all credit unions to find a means to conform to one common standard. While this is no easy task with all of the different data sources that exist in the credit union industry (Core, LOS, Debit, Credit, etc…), it is possible and several efforts are striving for this common standard such as the CUFX (Credit Union Financial Exchange) and OnApproach’s CU Analytics Platform (which leverages CUFX). While CuOS might not seem like a strategic priority for a single credit union today, the future needs to be the consideration. By establishing this common platform today, all credit unions will be able to leverage the work of the industry. The largest, and even the smallest of credit unions will be able to work together to compete with the rest of the financial institutions out there including the largest banks and the newly establish FinTechs. Rather than one credit union taking these institutions on their own, the industry would be able to work as one, leveraging its inherit collaboration, to compete with all other financial institutions. All of the work being done an industry platform versus a single credit unions site will begin to grow exponentially just as the apps and services on the Apple iOS have. Credit unions need to fully embrace the inherit collaboration of the industry they’ve always celebrated and come together on one common platform with one common cause – digitally transforming the industry to compete with the rest of the financial institutions in the digital age. This one common platform leads to success for ALL credit unions and builds an industry that will compete and survive for years to come.